This week I participated in my first subcommittee meeting as a member of the City Council. From my perspective, it was a reflection of participatory government at its best. Councilmember Tony Kranz and I presented a draft of the urban agriculture ordinance and invited comments from the public. Many “citizen farmers” offered helpful suggestions in a respectful tone based on their personal and professional experience in composting, bee-raising, and growing food. A strong representation from county and regional agencies reassured me that we have a diverse group of minds engaged in drafting this ordinance. The take-away for me was that the framework is solid – certain activities are proposed to be allowed by right, without needing to get a permit or come to City Hall at all. Small fruit stands would be allowed, along with small farmer’s markets in school parking lots, small community gardens, and small numbers of “agriconnection activities” like fermenting or seed saving classes in a backyard. When agricultural activity gets larger with potentially greater impact on neighbors (such as more traffic), a newly created agriculture permit would be required. This permit is streamlined from the currently required minor use permit to solicit only the information actually needed by the city government. There’s a community desire for the code to recognize residents’ rights to grow and share food and to create a more local food system. It’s also the city’s responsibility to prohibit health and safety hazards or nuisances that disturb neighborhoods. This proposed ordinance attempts to strike the right balance, recognizing that those interests can sometimes be in conflict. It’s also designed to be provisional – if we review it a year after it’s passed and there are problems, we’ll make changes. Encinitas is not alone in this pursuit. Oceanside is developing an “agritourism strategic marketing plan”. Here’s an article about this neighboring city’s efforts. Every week Encinitas hosts fun, lively community events. This coming weekend check out the Encinitas Street Fair in downtown. 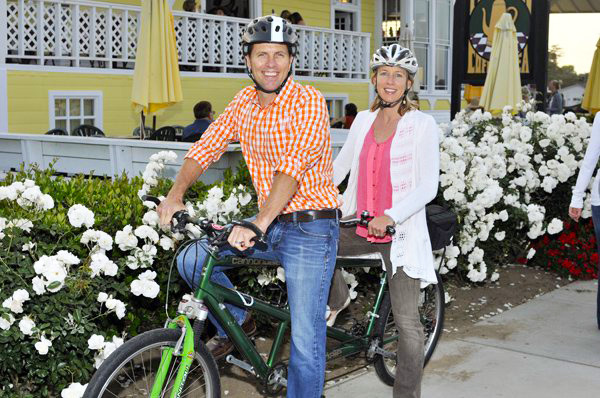 Pictured here on our tandem bike, my husband Jeremy and I attended the Taste of Leucadia, featuring food and “sip stops” from local businesses along Highway 101. Another important community event happened on the same day this week – a meeting about the proposed Coastal Rail Trail that drew about 75 people to Cardiff School. Many residents expressed strong opinions. The regional board, SANDAG, is planning to build a 30-mile bicycle/pedestrian path from Oceanside to downtown San Diego. We are lucky to have some of this regional money devoted to a project in Encinitas. This week’s meeting concerned the section from Chesterfield Drive in Cardiff to downtown Encinitas. The question is where the path should be located – east of the railroad tracks along Vulcan Avenue from Chesterfield to D Street in downtown Encinitas, or west of the railroad tracks on Highway 101 where we have existing bike and pedestrian facilities that could be improved. Planning in the rail corridor is very complex from a regulatory perspective and needs to be addressed within the context of larger circulation issues, such as crossing of the railroad tracks for beach access. Stay tuned for more to come on this evolving issue. At the City Council meeting last Wednesday, we sped through the agenda items in just over two hours, which is a record for my five months on Council. Next week we’re back to discussing the tradeoffs associated with what city projects to build, repair or fund. Next week we’ll also get our first glimpse of candidates’ resumes for the open city manager position. This position, like the CEO of a company, sets the tone for the way the city is managed. 1. Last week, Encinitas Mayor Kristin Gaspar and Solana Beach Mayor Lesa Heebner traveled to Washington D.C. to lobby the Army Corps of Engineers Civil Works Review Board for a multi-million dollar sand replenishment project in the two cities. The board voted 5-0 to let the project move forward for state and other regulatory review. 2. This coming week, on Thursday, April 30, from 3:30-5:30 p.m. at City Hall Councilmembers Lisa Shaffer and Tony Kranz, along with two members of the Environmental Commission, are holding the first workshop on Sea Level Rise and Coastal Vulnerabilities and have invited representatives from a number of regional agencies. The public is encouraged to participate. 3. The city accepted a grant from the California Coastal Conservancy for $150,000 to develop a conceptual plan for restoring historic sand dunes along the beach in Cardiff. The dunes would be created by sand that will be removed from the San Elijo Lagoon during the lagoon restoration project and would protect Highway 101 along the low-elevation barrier spit fronting the lagoon. “Not all of us can do great things. But we can do small things with great love.” – (frequently attributed to Mother Teresa) It’s inspiring to think that a lot of small actions can make a big difference. Have a great week and thank you again for your interest!